Mak Ho Yin has kindly translated this report published on 19 December 1964, two days before the opening ceremony of the factory on 21 December, in the daily newspaper Wah Kiu Yat Po. 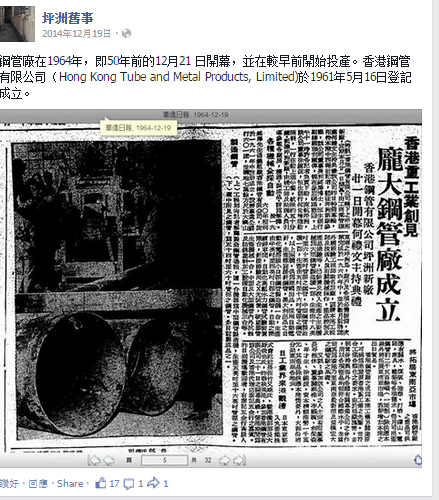 Opening of a Large Steel Tube Factory on Peng Chau by Hong Kong Tube and Metal Products Limited at Peng Chau on 21st December, to be officiated by David Ronald Holmes. The new factory under Hong Kong Tube and Metal Products Limited at Peng Chau will be launched on the 21st of this month, with a ceremony to be officiated by David Ronald Holmes of the Commerce and Industry Department. A media visit to the factory was arranged yesterday. Dr. Richard Charles Lee, chairman of the Board of Directors, and Lee Quo Wei, Vice-general Manager of Hang Seng Bank, greeted the reporters at Queen’s Pier. The group accompanied by Tsui Kan Po, the company’s director, and Ho Sai Tsang of Hang Seng Bank got on the vessel at around 11 am and enjoyed lunch during the fifty-minute journey on board. Upon arrival, the chief engineer and his assistants led the tour and explained the production. Initiated by Dr. Lee in early 1960, the company was formally registered in mid 1961. With an office located at Room 601 of Edinburgh Tower, it purchased 70,000 square feet of land on the island of Peng Chau southeast of Lantau. Installation of the production machines was completed in mid 1964, followed by hiring of overseas experienced engineers several months ago to train local engineers and technicians about the operation, product control and quality checking. A large tube production machine has been assembled and is under operation, producing tubes with diameter ranging from 16 inches to 60 inches. Another medium scale machine produces products ranging from 5 to 16 inches in diameter. These two machines are made in Germany, adopting automatic welding technology to produce spiral welded tubes. Other machines include an Austrian-produced automatic small-diameter tube producing machine which produces tubes from half to four inches in diameter, an automatic electroplate workshop, two automatic high-pressure tube testing machines, an X-ray equipment for inspecting the welding standard, a hard plastics tube producing machine, and three automatic machines for applying erosion-proof and stain-proof coating to medium and large tube products. Products of this factory are suitable for industries related to hydraulics, gas, oil, piling, mining, electronic, furniture and construction. Its monthly production can reach 2,500 tons (one shift). Apart from the local market, it will also open the markets in Southeast Asia with an aim to increase Hong Kong’s exports. Setting-up of the factory, which can be considered as the pioneer of heavy industry in the territory, opens a new path for diverse development for Hong Kong’s industrial arena. With good production management and frequent cooperation with overseas companies of this profession, its products meet international standards, a solid foundation supporting the factory to be the most modern and largest one in Hong Kong as well as Southeast Asia. Other news: Other persons investing in the company include Vice-chairman of the Board of Directors Shum Wai Yau, as well as directors Kwan Cho Yiu, Li Fook Shue, Li Jung Sen, Shum Choi Sang and Tsui Kan Po. Its capital is HK$10 million dollars. Some industrialists from Japan have arrived in Hong Kong and will also attend the opening ceremony to be held on the 21st December.